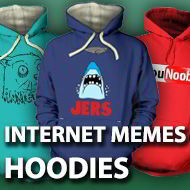 Hoodies based on popular internet memes, such as the Jean-Luc Picard Facepalm, grumpy cat, Jesus Christ Fenton the deer-chasing dog of Richmond Park, NAND Cat, the O RLY owl, Hawkward, It's Over 9000!, No, no, no cat, Er Mah Gerd, That's What She Said, Socially Awkward Penguin, The Geordie Horse-Puncher, No Time To Explain - Get In The..., and the controversial Cut For Bieber Twitter trend. Is there a meme that you'd like us to make a t-shirt design out of, that we don't yet stock? LET US KNOW! Get in touch via the CONTACT link at the bottom of the page.